Quiet, subtle, ethereal; such are the epithets frequently elicited by the crystalline glazed porcelain of American ceramist John Tilton. It’s no accident that John Tilton’s work is often described in metaphysical terms, for he intends, by using porcelain forms and his matte crystalline glazes, to address and explore the subtle realms of existence, or, as he puts it – the ‘macrocosm and microcosm’. A mathematician with a Master’s degree, Tilton was working on his qualifying exams for a PhD in Mathematics in 1969 when he realized his calling. He had been potting for about a year. Initially becoming interested in ceramics as a way to release tensions accumulated by his work in the high-intensity realm of graduate mathematics, he became consumed with his love of the material and the exhilaration of creating clay forms. He even installed a potter’s wheel in his bedroom, for lack of another place to put it. The “cosmic” imagery associated with Tilton’s work is evoked by crystals forming in the glazes which recall diatoms seen under a microscope or resemble photographs of galaxies taken in space. Crystals range from 2 cm (0.75 inches) in diameter at the largest, down to the size of the head of a pin. Different-sized crystals may even appear on the same piece; on a long-necked bottle, for instance, snowflake-like white crystals cascade over larger, vague blue crystals amidst washes of mauve, green and blue. The crystals also vary in opacity, ranging from translucent to opaque. 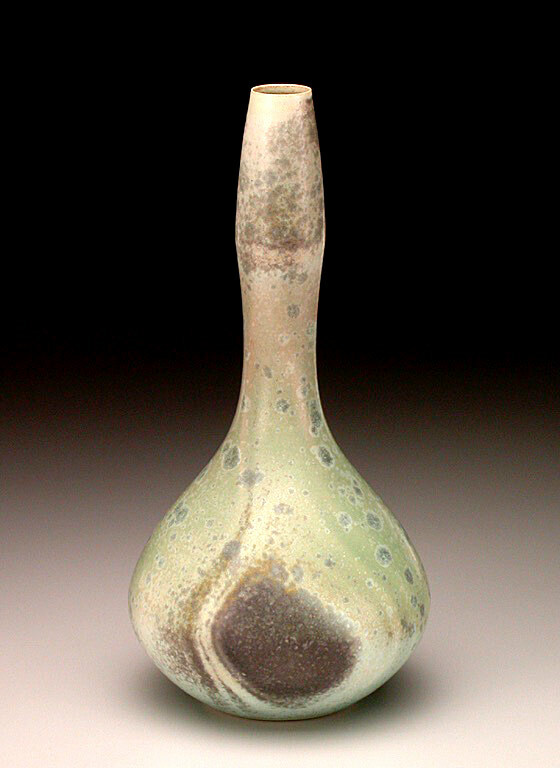 Tilton skillfully manipulates this quality to create the illusion at times that the glaze is emerging from within the piece, rather than being an applied surface. Translucence of the fired porcelain itself contributes further to this effect. Surface texture is another important element in Tilton’s work. Occasionally enriching the surface of pots with a swirl or dabs of slip, most of the time he prefers to allow his glazes to provide texture. Textural effects are rich and diverse, including a satin, almost shiny texture; a soft, skin-like one; a velvety, very matte texture; a hoarfrost-like texture, glimmering in a matte surface; and a dense, lava- like mass. ‘I’m interested in surfaces that don’t appear to be surfaces because of their depth, and in the way colour affects the pots.’ he says. With a matte crystalline-glaze palette that includes various shades of algae green, sage, light to dark blue-green, baby blue, beige, deep pink, shell pink, mauve, white and black as well as a copper-red Sang de Boeuf and a deep cobalt blue glaze, it seems almost inconceivable that Tilton is colour-blind. Though unable to see many of the subtle colour variations in his glazes, he does perceive differences in colour value more accurately than most people, and points out that the effects he finds most pleasing are also appreciated by others. 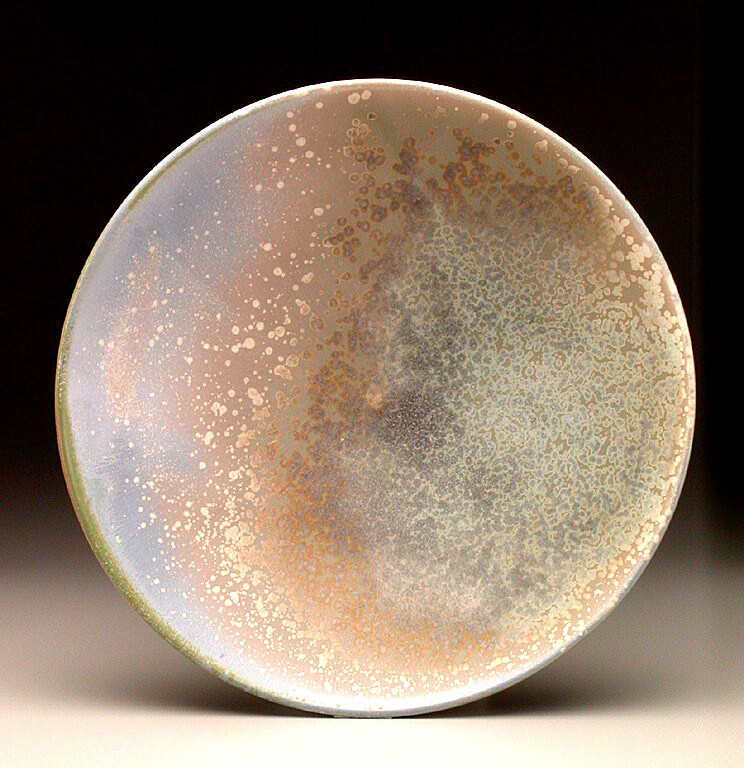 An insatiable experimenter and glaze developer, Tilton performs hundreds of glaze tests per year, formulating all the glazes he uses on his pieces. He does not take glazing lightly; every pot must dictate its own glaze treatment. Sometimes he withholds a pot from glazing until one is developed that suits the piece. Glaze application is complex: a piece may receive several dips into the same or different glazes, followed by a session with Tilton’s airbrush, which he uses to highlight, fill in or complement a pattern being developed on the pot’s surface. Such layering creates a feeling of depth in the glazes, forming shadowy shapes which loom behind the crystalline formations. 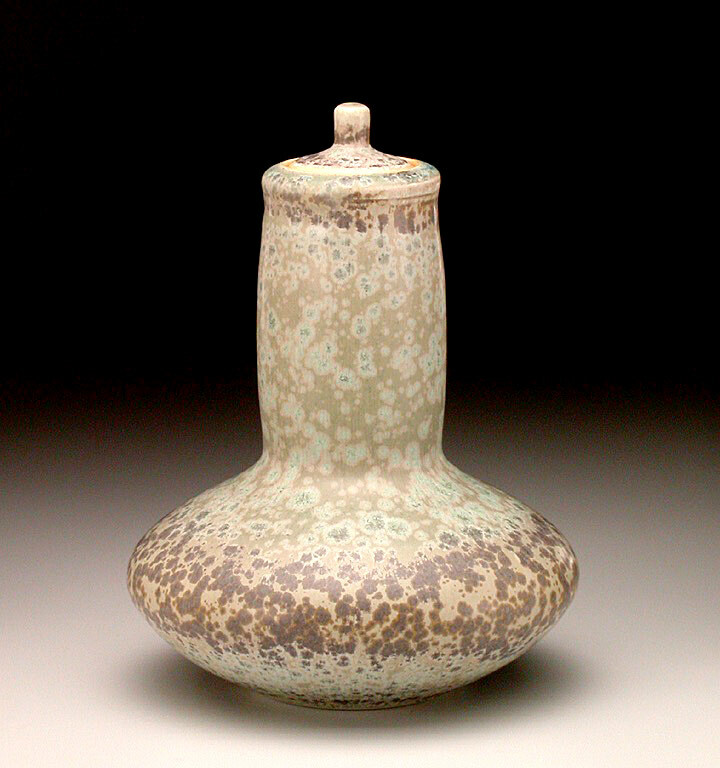 As the glazes are sensitive to thicknesses as minute as 1/1000th of an inch, glaze application must be flawless. Exacting records are kept on each piece to record how certain glaze effects are achieved. 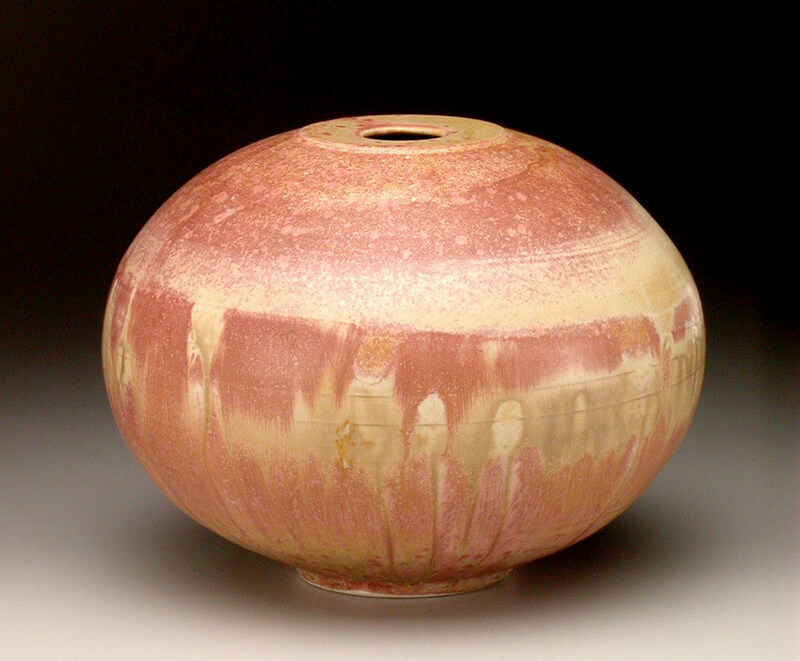 To facilitate application and eliminate process marks, Tilton designed and constructed a device allowing him to glaze a pot without touching any part of it but the waxed foot. He also modified a gauge to measure the thickness of raw glaze on a bisque surface, thereby enabling him to apply glaze more accurately. 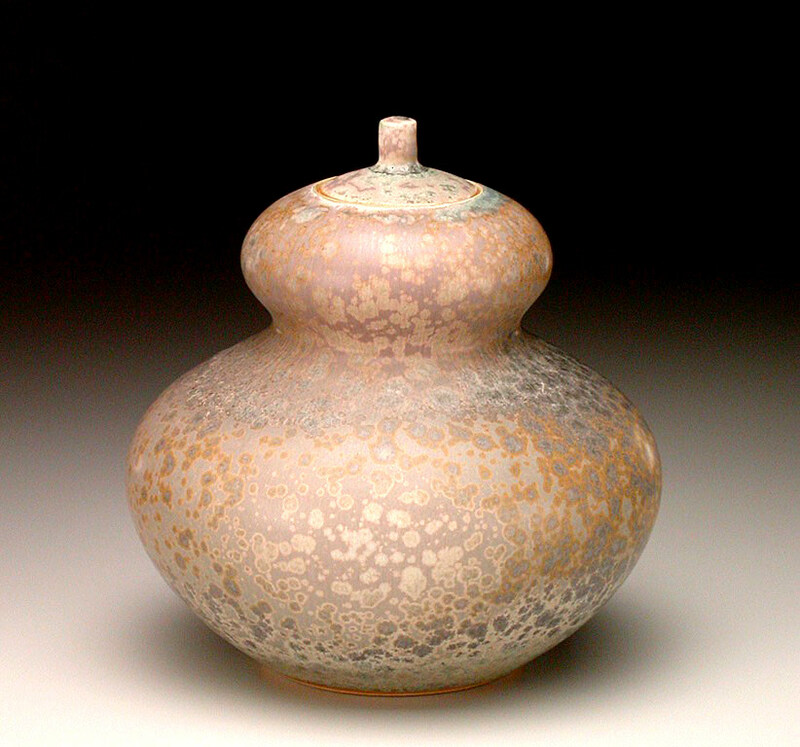 Tilton employs a diverse range of forms to express his vision, all originating with the thrown vessel. Confessing a deep love for historical and traditional pottery, he says he finds inspiration in their ‘mystery and beauty’, adding, ‘I’m not making traditional pots, but I acknowledge the debt I owe them.’ One factor that Tilton’s pieces and traditional pots share is their quality of endurance, a theme running throughout Tilton’s work. ‘It’s important to me that the pieces are of enduring value and have meaning over the life of ceramics; that they’re meaningful in an historic context.’ he says. Perhaps the form he is most identified with is the open, shallow bowl, the interiors of which become transformed into otherworldly landscapes under Tilton’s steerage. Inside these bowls, the glazes are allowed full expression and are free to run, pool and exhibit effects substantially different from those seen on the outside of the vessels. Common to all his forms is a feeling of compact spaciousness, the result of strategic throwing: ‘making every movement count’. Because translucence is important to Tilton, a great deal of time is spent in the throwing and trimming of each pot. Even if the piece ends up being glazed with a dark, opaque finish, translucence of the clay remains and contributes in a positive way to the outcome of the piece. Originally presented in Craft Arts International, Mar / June 1991 issue, pp.55-59. Articles published on the Tilton Pottery web site are done so with permission from the author and/or publisher. Images are different from the original article, but are from the same time period.